Guy’s Inc. will fill your tank according to the Weather Controlled Degree Day System. A normal delivery is scheduled when your tank is approximately 1/4 full. We do our best to keep track of your usage but please let us know if there is any unexpected change in your usage. 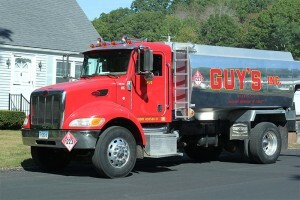 To go on or off Automatic Delivery, you must notify us in writing by faxing 860-739-6471 or emailing rich@guysoil.com. A Will Call customer is responsible for monitoring their tank level and calling Guy’s Inc. with a 2 business day notice for delivery. After hours deliveries, or Prime and Start, may result in extra charges. Same day delivery will occur only if our driver is in your area. Letting yourself run out of oil is not covered under any Service Contract and all costs for repairs are your responsibility. A Cap Budget Program means your price would not go up during the year of the program. With Downside Protection, it would ensure that you would receive the lower price on the day of your delivery (if our current retail price is lower than what you signed on for). There is a Cap Fee Charge for the Downside Protection. You must have a full tank of oil bought & paid for before this program can begin if you are a new customer with us. You can save up to 20 cents per gallon with our Auto Pay Charge Plan. With your credit card on file, we will automatically charge your card after a delivery is made. This plan can also be used for any service work and budget payment plans. RENTERS ARE REQUIRED to have a valid credit card on file. If we have not been notified of a new tenant that has moved in and the account is on automatic delivery and in the Owner’s name, it is the Owner’s responsibility to collect from the tenant any amount due until the account is set up in the Tenant’s name. RENTERS ARE REQUIRED to have a valid credit card on file. Tenants are required to provide us with a forwarding address when moving. If you require service, you agree to pay parts and labor charges under the same terms covered by this retail agreement. Automatic delivery customers receive a preferred customer discount on service. Service Contracts: If you have a Service Contract, please note that not all parts and labor for your heating system are covered. Your account must be on Automatic Delivery with us. Pre-existing conditions will not be covered, and we reserve the right to inspect the equipment before approval for a Service Contract. An invoice is sent within 2-3 business days after a delivery or service work showing the details of work performed or gallons delivered. All invoices are expected to be paid upon receipt unless other payment arrangements have been made. Any invoices not paid within 30 days are subject to Finance Charges. Any account balance not paid in a timely manner may be referred to our collection agency and our attorney. You will be liable for all reasonable fees incurred plus all court costs, expenses and finance charges. You or Guy’s Inc. can cancel your account at any time with an advanced written notice by fax (860-739-6471), or email (rich@guysoil.com). You agree to remain responsible for payment on all purchases made before the cancellation notice. We also have the right to cancel your account if you do not make payment in a timely manner. If you have any questions regarding the application or this agreement, please contact us at 860-739-8700.